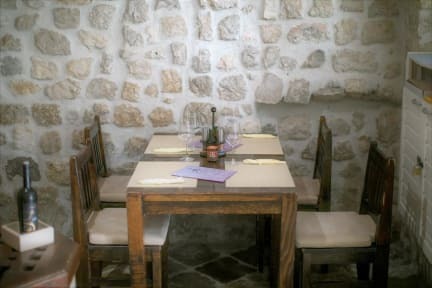 Hostel Amnesia is located in the center of the old town of Dubrovnik, which is under UNESCO Protection and it is only 15 meters away from the main street Stradun. Just a couple of meters from Hostel Amnesia there are various restaurants, pizzerias, bars, galleries and shops. Historic sights, such as Orlando's Column, Onofrio's Fountain, filming set of movies and series like Game of Thrones/Star Wars and crystal clear water of the sea can be reached within a 5-minute walk. Guests can enjoy a stroll along the Old Town Walls or a cable ride offering panoramic views of the entire town. Pile Gate a 5-minute walk away. The well-known Banje Beach a 10-minute walk away. The Main Bus Station is 3.5 km away, while local buses stop just a short walk away. Dubrovnik Airport is at a distance of 25 km. City Tax is 1 Euro per person per night which is not included in the price. Payment upon arrival by cash. Credit Cards Not Accepted. Couldn’t have asked for a better location. Ended up having a whole room to ourselves which was a bonus. Booked this last minute. Good location and place to meet people in the common room for a night of drinking and social. Besides the common room, there was nothing else! There was only a small fridge to put like alcohol, no kitchen or anything else to cook in the hostel. Ana, the hostel owner, had good tips on what to do and discounts at restaurants for 10-20% close by. Anna was helpful and really nice, location was perfect (near bars and restaurants) and towel included was a good surprise! Room was a little cramped and would have been nice to have maybe a kettle or small kitchen but the common area was great to meet people and socialise. Would stay again. Thanks Anna! The staff we're very friendly the lady who worked there was very helpful she explained all the places were and what street they were on she even marked all the places on the map for me. When I was coming in after a night out I had to turn on the light because the room was very dark and this American guest who was staying 3 nights with his girlfriend was a bit narky when I turned on the light I wasn't trying to wake the other guests up and he was intimidating too. Pros-perfect location right in the old town, check in was relatively simple and we were able to eat at the restaurant with a % off! Cons- 12 person bedroom wasn’t fun when you have one shower/toilet with a broken shower handle. It’s right next to a night club thats very loud along with getting woken up by drunk people chatting at 4am in the room. Wasnt a terrible hostel but definitely does not deserve a 9 rating! This hostel is right beside a night club so it's very loud at night. The main door is left open all day so anyone can walk in and go up to the dorm rooms (especially if someone from your room has not locked the dorm room door) however there are lockers for your valuables. Theres no kitchen, only a fridge. The volunteer staff are really nice and create a good vibe for guests. It is out of season so we were able to join up with a neighbouring hostel (Hostel Ana) to socialise. Location is perfect: easy to get to, right in the heart of the old town and close to everything you need. Other good things were the free towel, and you could also do washing for free. On the downside the place was cramped, bit dirty, and loud (as mentioned in other reviews). Bathroom in the 12 bed dorm was tiny and smelled bad most of the time. Okay overall but probably wouldn’t stay again. i just stayed there one night cuz i had no other option. no one was ever in the reception while i was there, so no tips, recommendations or any type of organization from the hostel. it was even hard to find someone to pay for it. the location is great, but gets super loud at night. I stayed in a 4 mixed dorm and our room unfortunately smelled like mildew due to the bathroom in our dorm. We tried getting the smell out with the window and AC but it was pretty bad. Also, the hostel attracts 18 year olds who party and come in at 4am loudly, and there is a club across the street playing loud music all night 2am+ even on weekdays and even when there is no one there. Host was nice but I don’t recommend this hostel.